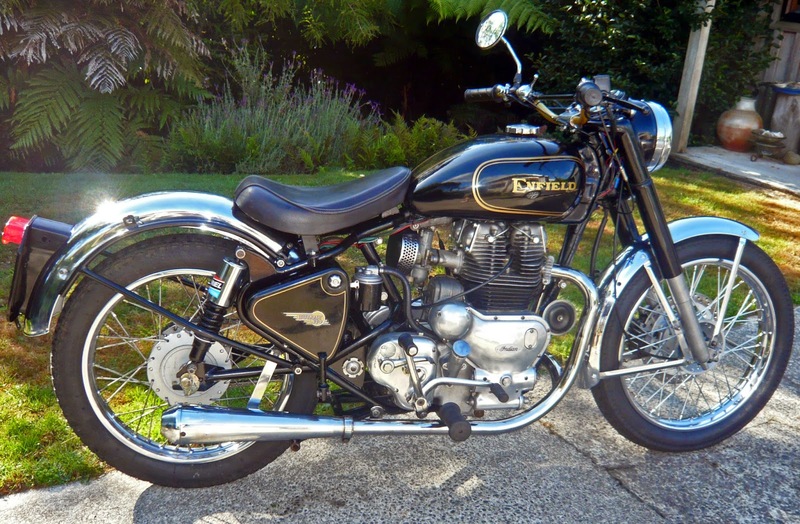 Nice looking Royal Enfield Bullet. Hey, that's a twin! 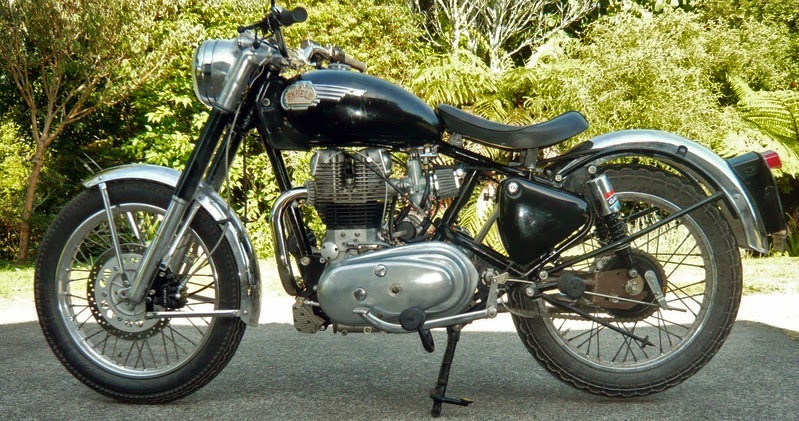 Royal Enfield enthusiast Tim Busby of New Zealand has the mechanical skills to make unusual things happen. Lately his flair for the exceptional has led him to build two powerful and fast Royal Enfield twins virtually from piles of odd parts. The results look great but — madness! — his most recent "hybrid" looks from a distance more like a mild Royal Enfield Bullet than the mighty-mighty Interceptor it resembles mechanically. It doesn't even use shiny dual mufflers to give away its 736cc vertical twin motor. 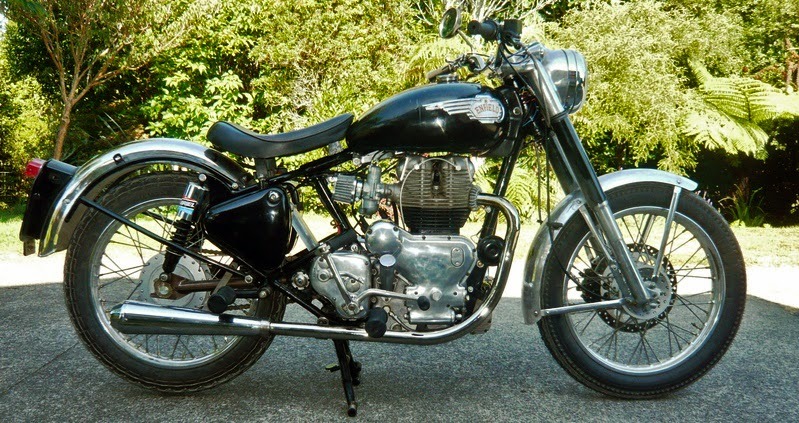 Tim let the members of the Royal Enfield Interceptor Owners Group on Yahoo in on it all recently, posting photos of the latest machine. Which he calls his '53/'63/'93/'03 Meteor/Interceptor/Bullet Hybrid. "This hybrid has: '53 Meteor frame, '63 Interceptor Mk-1 engine and 'box, '70 Interceptor SII primary side, '93 Indian Bullet tank and tool boxes, 2003 Bullet disc front end and guards. Pretty much the only 100 percent original unmolested part on the bike is the swingarm, (and that is) New Old Stock," he wrote. And isn't it amazing that all these Royal Enfield bits from across half a century bolt right together? It looks like a Bullet but it's better. Note Interceptor oil cooler. The actual tale of how Tim assembled his hybrids is fraught with suspense, as parts that look like mates decline to fit, mysterious motors purchased sight unseen present challenges and even a brand new carburetor right out of the box fails to — ahem — pass gas. On the other hand — naturally — the 1958 spark plugs in the first hybrid still work fine. Along the way, Tim got new pistons for his latest hybrid and lightened them himself, had the cams rebuilt to Constellation R specifications, used later model Bullet clutch and alternator parts he likes, fit a close ratio gear set and had the magneto rebuilt. He failed to notice the swingarm was twisted until it came time for assembly. Good luck, Hitchcock's had a heavier, New Old Stock swingarm designed for sidecar use. There were many, many other details to work out. Something as seemingly simple as having the braided front brake hose shortened 6 inches meant repeated trips to the shop and, ultimately, the purchase of an entirely new line. Tim had 1993 Bullet tool boxes and tank on hand that just needed repainting. 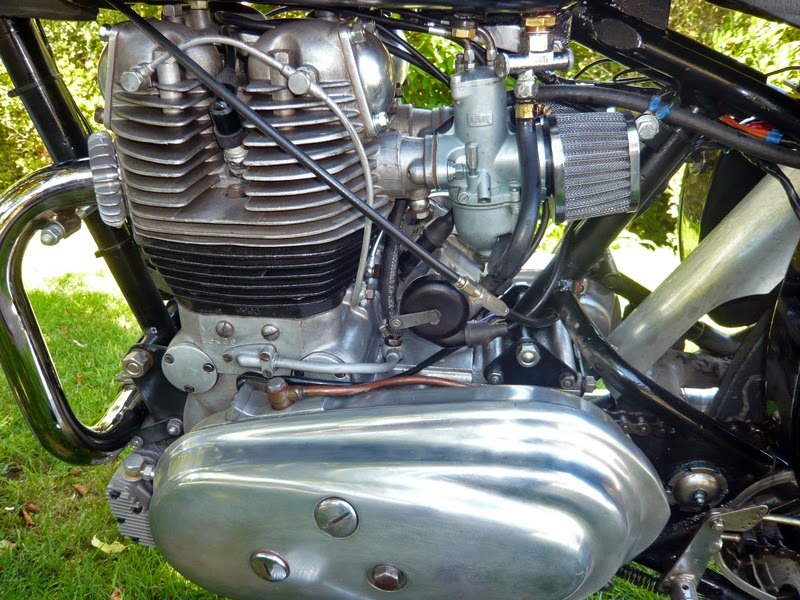 Twin cylinder, twin carb Interceptor motor. In the end, the 1953 Meteor frame (no one knows what happened to the rest of the motorcycle) and 1963 Interceptor motor (originally dispatched to California, no other history known) and 2003 Bullet forks and disc brake made a fine motorcycle. "All-in-all, very happy with the 53/63/93/03! Now, if anyone has some spare bits from off a '73 and an '83, I could be interested," he writes. But why do it at all? "Inspiration for the bikes? Not much at all, really," Tim wrote me. "It was far cheaper for me to make the Meteor Interceptor Bullet than to buy a new 535 GT." with wheels, forks, tank and guards from India. So let me get this right....a guy from New Zealand scrounges parts from every nook and cranny....then does in his garage what Eicher can't. A toast to Tim in Zealand and a moutza to Sid and his pals in India! Royal Enfield bikes have to be one of the best bikes around. A very well presented blog by the way.